Preheat a heavy-bottomed pan over medium heat until hot. Split the butter in half and spread it on one side of each tortilla. You can stack them so that the buttered sides are facing each other to keep them from sticking to your board. 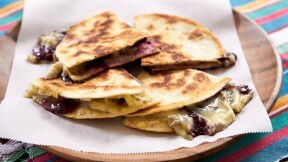 With the non-buttered side up, lay 4 slices of brie on the tortilla and then drizzle on the blackberry preserves. Put the tortilla buttered-side down on the pan and top with another tortilla with the buttered-side up. Fry the quesadilla, using a spatula to gently press it down so that the tortilla is making good contact with the pan. When the bottom tortilla is browned and crispy, flip it over and fry the second side. You don't need to press this side down, as the cheese will squirt out from the sides.